Your committee, in placing this before the members, at the First Annual Meeting of the “Old M.B.C.” the report for the year 2017, can assure you of another successful year added to the long record it is our pleasure to look back upon. We have greater reason to feel satisfied when we remember that this was the first year of the reconstituted club in over a century. The first event of the year took place on March 4. It was a presentation for Nuit Blanche of a photo exhibition which was originally made for Parking Day in September 2016. The exhibition had two displays; the first a parked car Photo Mosaic of modern day cyclists in and around Westmount, and the second, historical photographs of early 19th century Montreal cyclists. The two were mounted side by side in Christchurch cathedral. There was also a computer slide presentation on how Montreal Cycling began. 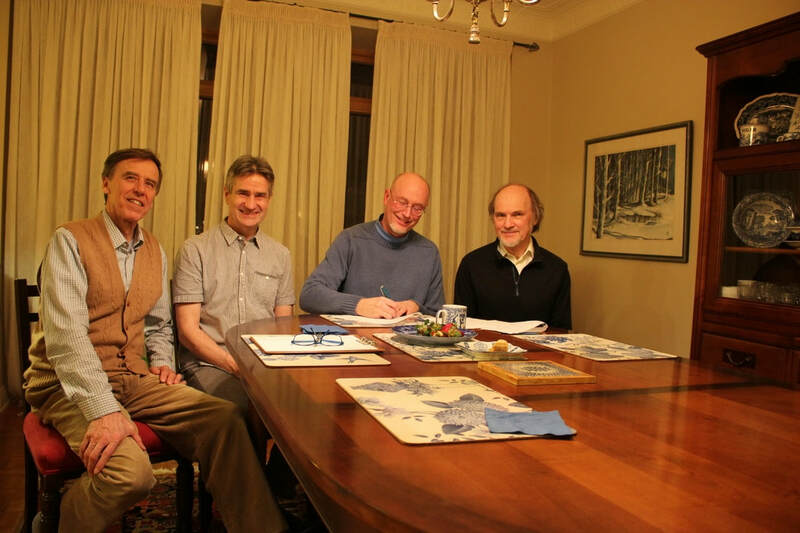 The Re-Founders meeting of the Montreal Bicycle Club was held on the 25 March 2017. Using the original minute book from 1878 as a guide, the meeting reviewed the Bye Laws, and made revisions as they thought necessary. Following the Re-Founders meeting a “Riding” uniform, modeled in the style of the original club was decided upon and an inventory of shirts ordered for new members. By tacit agreement, yet to be inked into the bylaws, membership is granted to a new member who purchases a jersey, or partakes in events, and of course abides by the existing bylaws. In addition to members living on or near the island of Montreal, members have been added in Philadelphia, Pasadena, Pangnirtung and Paris. Hence the fascination of the club with cities that begin with the letter “P”. 3. How a bicycle overpass over the Turcot interchange could connect the Lachine Path to the de Maisonneuve path. On the 18 May, at the Atwater Library, a talk was given about the Montreal Bicycle Club and the early history of cycling. It was not until late June, however that regular Fixture rides were held by the reconstituted club. 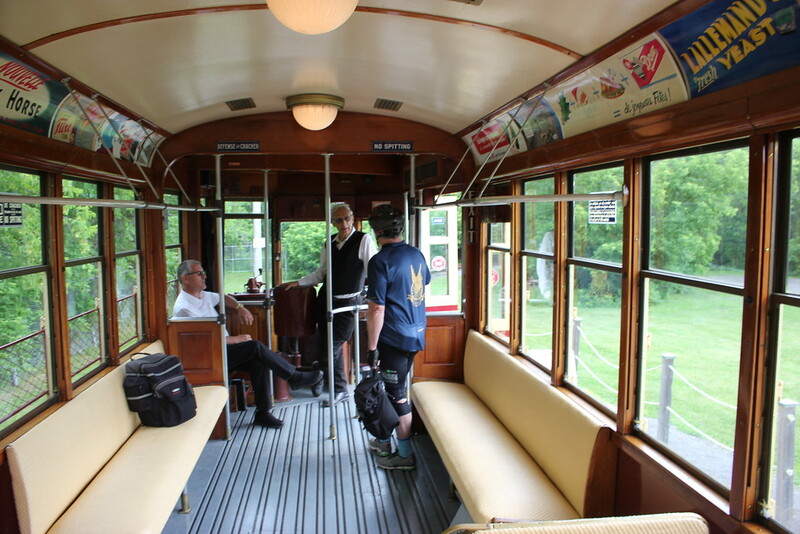 On the 21 June two members took an AMT train to the Canadian Railway Museum in Saint-Constant for a tour, then rode back to their homes on the island of Montreal. This was followed a week later by three members on a similar combination AMT train trip and bicycle ride from Deux Montagnes to Ste Anne de Bellevue. Fixture rides continued throughout the summer with trips to Valleyfield, an overnight to Lac Gustave in the Laurentians, and a wide variety of other locations in and around Montreal. Two other multi-day rides were held, one on Route Verte to Quebec City via Sherbrooke, and a second from Ottawa to Montreal. The closing ride was held 21 November, going across town to the Olympic Stadium. Two remote excursions by club members were held, one in Rome Italy, and a second in Los Angeles. Between the Opening and Closing RIdes, the club covered 1,974 Km on 26 rides attended by 80 members. No Fixtures were cancelled on account of bad weather. The following is a list of Individual distance, made by the club on advertised rides along with the number of rides attended. A Table of Statistics, from the years 1882-1901 and the current year was prepared in order to compare the original Montreal Bicycle Club Fixtures and that of the modern one. In those early years the club’s rides had a larger attendance, more rides, which tended to be of shorter distance than in the year 2017. Total ride mileage was comparable between the two periods. The longest ride of the year, from Montreal to Quebec city by way of Sherbrooke was done primarily on the Route Verte dedicated bike paths separated from car traffic. Similarly the next longest, from Ottawa to Montreal was again largely on a separated path, the Prescott Russell Recreational Trail. Many of the rides involved train or ferry transport in addition to the bicycle, however none required carpooling by the members to or from the actual ride location. We hope to continue to apply this principle for rides in the coming year for which we plan to include Pittsburgh to Washington DC and The Petit Témis between Rivière des Loups and Edmundston NB. On the meeting held the 6 September it was decided that members adopt Sobriquets of early cyclists and the club’s minutes of meeting use such names whenever possible. In closing I quote from the 1895 Annual report. “Personally try to see that your “Old Club” reaps the full benefit of the greatly increased interest now taken in wheeling. Avail yourselves to the full that of the membership privileges offered, and with a true brotherly feeling, try to induce the unattached wheelmen and others with whom you come in contact to share your advantages.